Product #16584 | SKU SG2LRB6 | 0.0 (no ratings yet) Thanks for your rating! 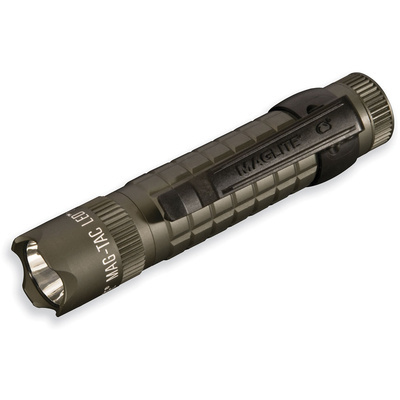 The foliage green Mag-Tac LED Flashlight from Maglite is a handheld illumination tool designed for civilians yet rugged enough for tactical professionals. Its 320-lumen LED light source is capable of producing a beam visible at a range of 200 yards. This configuration of the Mag-Tac has a crowned bezel that concentrates the blunt force of the flashlight housing onto scalloped edges. If an emergency requires the operator to fend off an attacker or shatter a window, the Mag-Tac's crowned bezel can make a lifesaving difference. Stand the Mag-Tac on its head and the crowned bezel will leak light onto the surface of the immediate area, great for low-level illumination like map reading. Like the other illuminators in their lineup, Maglite built the Mag-Tac for a lifetime of use. This three-function light features Maglite's proprietary Quick-Click mode selector tailcap, which enables the operator to set their desired output mode without cycling through the other modes each time the light is activated. When the tailcap is in the Momentary position, the flashlight will only illuminate while the switch is pressed. In addition to Momentary and Constant activation modes, the Mag-Tac also has a full-power Strobe mode that pulses at 12Hz. Like other Maglites, the Mag-Tac is machined from a lightweight aluminum alloy, anodized inside-and-out for enhanced corrosion-resistance, and manufactured in the United States. A weather-resistant housing, deeply knurled grip, and included pocket clip help make the Mag-Tac a full-featured illumination tool.